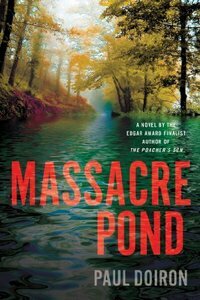 Massacre Pond by Paul Doiron: Synopsis and Online Purchase Options. Synopsis (from the publisher): On an unseasonably hot October morning, Bowditch is called to the scene of a bizarre crime: the corpses of seven moose have been found senselessly butchered on the estate of Elizabeth Morse, a wealthy animal rights activist who is buying up huge parcels of timberland to create a new national park. What at first seems like mindless slaughter — retribution by locals for the job losses Morse's plan is already causing in the region — becomes far more sinister when a shocking murder is discovered and Mike's investigation becomes a hunt to find a ruthless killer. In order to solve the controversial case, Bowditch risks losing everything he holds dear: his best friends, his career as a law enforcement officer, and the love of his life.